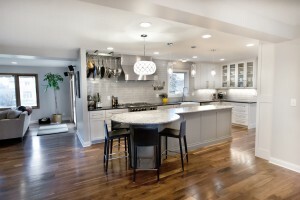 Natural or sustainable woods: Custom kitchen cabinets made of natural or sustainable woods –think bamboo or alder wood – help keep a kitchen looking open and inviting. These woods also help to embrace the environmentally conscious preferences of many of our Minneapolis clients. Light-colored stains: For homeowners who want a splash of color instead of natural wood grain, white still rules the day. That said, off-white and grays are increasing in popularity. These colors make a kitchen appear brighter and larger, and they are colors that last the test of time. Floor-to-ceiling cabinets: There is no longer any question about the benefits of floor-to-ceiling cabinetry. These cabinets give a more cohesive look to your kitchen while also increasing storage options. Concealed appliances: Hiding appliances through the use of custom kitchen cabinet doors is one of the smartest kitchen cabinet designs out there. This allows you to camouflage your appliances, allowing the focal point in your kitchen to be your custom cabinetry. Customized built-in storage: One of the greatest benefits of custom kitchen cabinets is the ability to design and install unique storage solutions that fit your needs. We can help you develop clever ways to store pots, pans, utensils, and more. Open shelving: This is by far one of the hottest kitchen cabinet design trends that cabinet makers and contractors are pushing today. And for good reason. 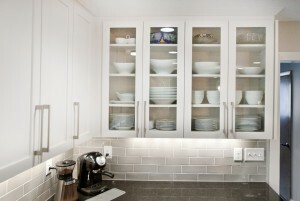 Open cabinets open up a room while also allowing for easier access to your highly used items. For the biggest trend for your dollar, try combining the use of sustainable or reclaimed woods for your open shelves. Glass-front doors: By working with a cabinet designer, you can create a beautiful mixture of full doors and glass-front cabinet doors to add greater eye-appeal to your kitchen. The use of glass-front doors can particularly benefit larger kitchens, as they help to break up the blocky look that a lot of cabinetry can sometimes create. Custom furniture as custom cabinetry: Building custom cabinet pieces, such as islands, that look more like antique furniture is quite the craze right now. There are also ways to design your cabinets so that they sit on feet instead of running all the way to the floor. We believe these kitchen cabinet design trends are more than just passing fancies. Indeed, all of these could come together to create the new kitchen of your dreams that will last you a lifetime. Do you agree? Or, do you think we’ve missed one of the best trends around? 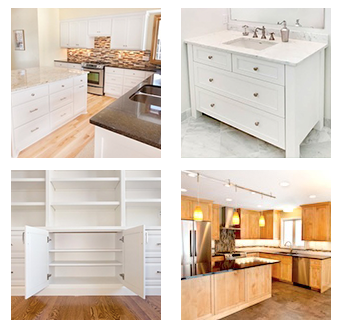 Leave your thoughts in the comments below, or give our cabinet designers a call at 952-737-7088.